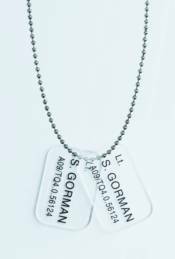 Hollywood Collectibles are proud to present the second wave of officially licensed prop replicas of the dog tags worn by the Colonial Marines in James Cameron's film Aliens! These authentic reproductions are made from clear acrylic, exactly the same as the ones used in the movie, and complete with name, rank and serial number! Each consists of two identical Dog Tags and a ball chain. Choose from Hudson, Vasquez, Gorman, Dietrich, or Wierzbowski.